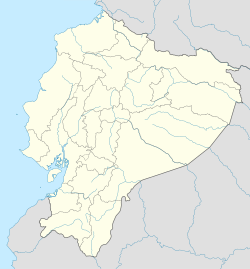 Esmeraldas (Spanish pronunciation: [ezmeˈɾaldas]) is a coastal city in northwestern Ecuador. It is the seat of the Esmeraldas Canton and capital of the Esmeraldas Province. It has an international sea port and a small airport (IATA location identifier: ESM). Esmeraldas is the major seaport of northwestern Ecuador, and it lies on the Pacific coast at the mouth of the Esmeraldas River. It is exactly at the antipodes of Padang, Indonesia. The city is the principal trading hub for the region's agricultural and lumber resources, and is the terminus of the 313-mile (504-km) Trans-Ecuadorian Pipeline from the oil fields in northeastern Ecuador. Esmeraldas is well known around Latin America given the large number of locals that have historically played in the Ecuadorian national football team. The port of Esmeraldas is economically important for the northern part of Ecuador, and the port of Balao is an important oil processing facility. Exports from Esmeraldas include wood and wood chips, bananas, and other agricultural products. The soil allows the production of rice, maize, African Palm, albacá and a variety of tropical fruits. Among the main forest species are: chanul, raft, laurel, sande, guayacán, and tangaré. Cattle and pig rearing are also important. The fishing industry is also an important economic indicator of the region, and includes species like corvina, snapper, lisa and tuna. Industry in Esmeraldas consists of manufacturing, timber, chemicals and oil. Concerns exist about forest management and deforestation in the Chaco rainforest. The trans-Andean pipeline was completed in August 1972, connecting the Oriente reserves to refining facilities in Esmeraldas, and the oil industry is the largest employer. In 1987, the refinery was expanded for the first time to 90,000 barrels per day (14,000 m3/d). The second expansion, to 110,000 barrels (17,000 m3), occurred in 1995. The plant is currently running at 80 percent capacity with hopes to return to full capacity by 2014. The petrol produced there is used for mixtures because of its high aromaticity. Like most of the Ecuador coast, Esmeraldas has a hot semi-arid climate (Köppen BSh) with a wet season from January to April, a dry season from May to December, and consistently very warm to hot and cloudy weather due to fog from the Humboldt Current. Tourist attractions include beaches, virgin forests, the culture of the indigenous Cayapas people, marimba and Afro-Ecuadorian music and the La Tolita archaeological zone. Other attractions include Atacames, famous for the "crazy coconut" (coco-loco, traditional drink made with coconut water) and its handicrafts in black and red coral. Saami, an area of large Palms which extends by serene waters and blue; Muisne, with pristine beaches of warm sand inhabited by Red crabs in a tropical atmosphere; Quinindé, with vast African palm trees and cane guadúa; houses, and Tonsupa, famous for its beautiful sunsets. The U.S. State Department advises caution when travelling to the northern border region of Ecuador, including Esmeraldas. The main road runs along the coast by joining La Tola, Lagarto, Montalvo, Rocafuerte, Río Verde, Camarones, Tachina y San Mateo. Other routes are: Esmeraldas - Atacames - Súa - La Unión - Muisne - Esmeraldas - Quinindé (Rosa Zarate) that lead to Santo Domingo and Quito. The Quito - San Lorenzo rail network is still in use. The Carlos Concha Torres International Airport offers both national and international services to Cali, Colombia. ^ "Siete esmeraldeños integran la Selección ecuatoriana". El Comercio. Retrieved 19 April 2018. ^ Laura Rival, "Industrial and Non-Governmental Community-Based Forest Management in Esmeraldas, Ecuador" Archived from [www.etfrn.org/etfrn/eucomm/6fp/documents/ecuador.pdf the original] 2012-02-26. ^ Bruce Currie-Alder, "Under the Shadow of a Star: Sustainability and oil development in the Ecuadorian Amazon" Archived from the original 2012-02-26. ^ "Living in Esmeraldes, Ecuador" Archived from the original 2012-02-26. ^ "Weatherbase: Historical Weather for Esmeraldas, Ecuador". Weatherbase. 2011. Retrieved on November 24, 2011.